After a few years of living in Toronto I am proud to say I have finall y been to Krinos Taste of the Danforth! Celebrating its 21st year with an expected 1.5 million+ attendees, this incredible festival is put on primarily by volunteers from the local community. Community has always been at the core of the festival’s success since its creation back in 1994 . A group of restaurateurs collaboratively decided to work together to attract as many people as possible to try their authentic Greek cuisine instead of advertising individually. They pooled together their resources and set up tasting tables for visitors to try as many different restaurants as they choose. 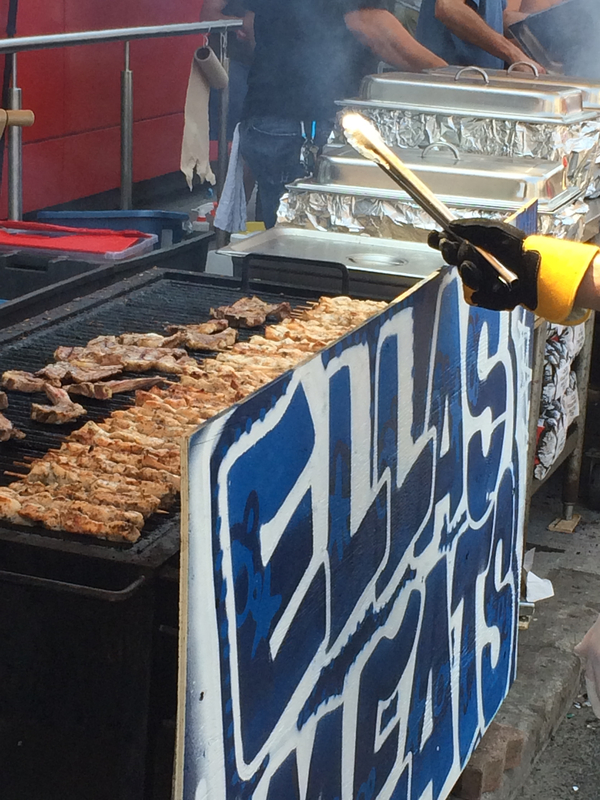 As we tasted our way through the street it was Ellas Meat Market that stole the show. This family run business has been treating their customers like family since it was established in 1977. We were lucky to have gone shortly after lunch hour to miss out on the super long wait lines. In saying this, that means we did get the summer sun at its strongest and went home with a true Canadian suntan. This entry was posted in Canada, Festivals, Toronto and tagged canada, food festival, Krinos Taste of the Danforth, local community, Ontario, toronto. Bookmark the permalink.